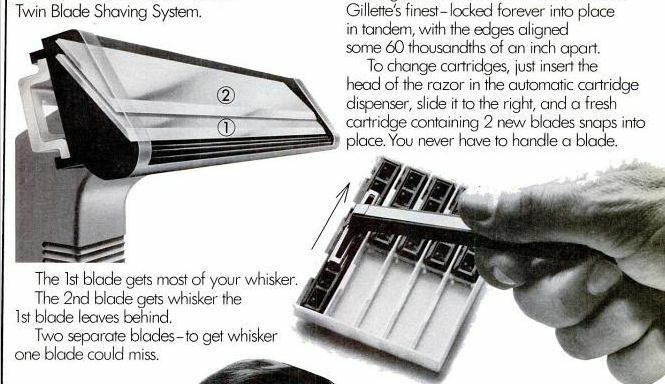 In 1971, Gillette introduced the world's first multi-blade razor system to the North American market: the Gillette Trac II Twin Blade shaving system. It consisted of 2 blades placed closely together in a plastic cartridge. Instead of changing the blade directly, shavers slid the cartridge onto the handle. Gillette advertised the Trac II pretty heavily. Check out this 2-page ad from LIFE magazine (December 10, 1971); it features the slogan "It's one blade better than whatever you're using now." The TV spots often featured athletes, and each one emphasized the special advantages of having 2 blades instead of 1. You can find other Gillette ads from the 70s at Archive.org; it makes for some fun viewing. One of the claims Gillette made in most of their ads was that 2 blades shaved closer than 1 blade due to what they called the "hysteresis" effect. That is, the first blade would cut a hair and, in the process, pull it out a tiny bit from the skin. Before the hair could snap back to its regular position, the second blade would come along and cut the same hair just a little bit closer than the first blade had, resulting in a shave that lasted longer than a single-blade shave. Was the claim true? Hard to say. Certainly, many people think that the hysteresis effect was more hype than science. For instance, this "Straight Dope" article by Cecil Adams from November 25th, 1983, goes at the question in depth. Gillette claims to have done slow-motion microphotography that shows hysteresis actually works. In an Esquire magazine article on this subject some years ago, a spokesman for Bic, one of Gillette's chief competitors, admitted his firm couldn't prove hysteresis _didn't_ work. Nonetheless, years of testing by consumer magazines and by the razor blade companies themselves have never demonstrated any clear superiority for twin blades--at times, quite the contrary. Some people (especially those with very thick or curly hair) report experiencing ingrown hairs more frequently with multi-blade razors than with single-blade razors - the hysteresis effect is sometimes cited as the reason why multiple blades increase the incidence of ingrown hairs. Whether people believed the hysteresis explanation or not, they definitely bought the razors, and the Trac II was a great commercial success. Gillette still makes cartridges for the Trac II; I can buy them locally in all of the supermarkets and pharmacies that I regularly shop at, for instance, and there are plenty of sources online. Finding a handle is a bit trickier - Gillette doesn't seem to sell them any more, at least in North America. So if you want to try out Trac II cartridges, you'll have to find a handle some other way. The Trac II was marketed as the GII in Europe; I've found a few G2 handles listed on eBay. You can also find handles made by other manufacturers online, and sometimes in stores. There are a number of clones available that fit Gillette's Trac II cartridges too. I found a fairly solidly-built plastic handled version called the Precision Twin 2 razor at a local Dollarama (5 cartridges plus the handle for $1) which shaves great, for instance. In many Wal-Mart stores in the US (and on Amazon.com), you can find the Bump Fighter razor, which also fits Trac II cartridges. A number of manufacturers also sell cartridges modeled after the Trac II, usually naming them "Twin" or "Twin Plus" razors, and usually charging a fraction of what Gillette charges. So, is the Gillette Trac II still relevant in the age of 5+ blade razors? I think so. One of the complaints I read about frequently is the cost of modern razor cartridges. It's a complaint I can sympathize with; at local stores, a Gillette Fusion ProGlide cartridge averages somewhere around $5! Trac II cartridges, on the other hand, can be had for around $1.50 each, and you can find knock-off cartridges for less than half that. And the shave? Well, the most important part of getting a good shave isn't the razor, it's the preparation. If you ensure your hair and skin are very wet, and you've got a good shaving lubricant properly applied, then any good, sharp razor will do the job. I've been trying out Trac II and generic Twin razors recently, and getting the same type of close, comfortable shaves that I'm used to from the more expensive Mach 3 and Sensor razors that I've used previously. Definitely worth checking out, if you're looking to cut costs but keep your shaves close and comfortable! If you like the cartridge there are a number of people on Ebay or Etsy selling beautiful hand-made luxury handles. They'll last a lifetime and make your shaving a pleasure. Used to love this razor. Thought I would never find this razor again until I bought one in a local hospital shop in Bridgewater Hospital. By far one of the best razors ever created. I wonder if Gillette ever used online data room providers for their business deals or for audit?